Feel free to use these resources as you go forth on your kindness crusade. Be sure to check out our step-by-step instructions where we explain how all these pieces came together. 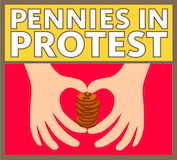 Visit Patience’s Flickr feed to see pennies in protest photos. And then, visit Jessica’s Flickr feed for even more inspiration. 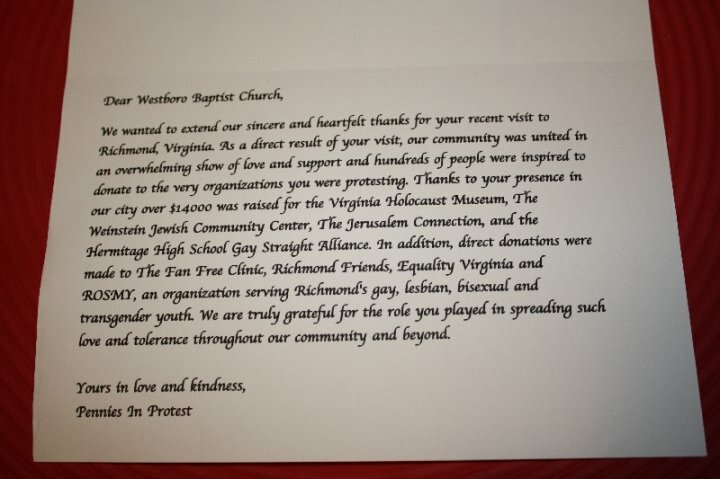 Patience made this beautiful love note to Richmond, Virginia from Pennies in Protest. It features photography by Patience Salgado and Jess Lucia. Lots of cities decide to turn hatred into kindness by raising money. Some did it before us, some did it after us. Here are a few. If you did it in your city and have a link, please send it to sarah dot allenshort at gmail dot com and we’ll add you to the list. We had access not only to the resources you see on this page. Andrea Goulet and Scott Ford of www.corgibytes.com contacted us right after we launched Pennies in Protest and offered to build us a website for free, just because they believed in what we were doing and wanted to help the best way they knew how. Once the dust had settled, we decided their talents would be best used to make a website that teaches other cities how to do what Richmond did. The result was this very website: www.penniesinprotest.com. Corgi Bytes enlisted Christy Rupertus at Design and Conquer to donate design services and make us a logo! Thanks to Andrea, Scott, Christy, and all the other people who helped make Pennies in Protest something that anyone, anywhere can replicate! Also, special thanks to Kevin Clay at www.GayRVA.com for all the help and support along the way.